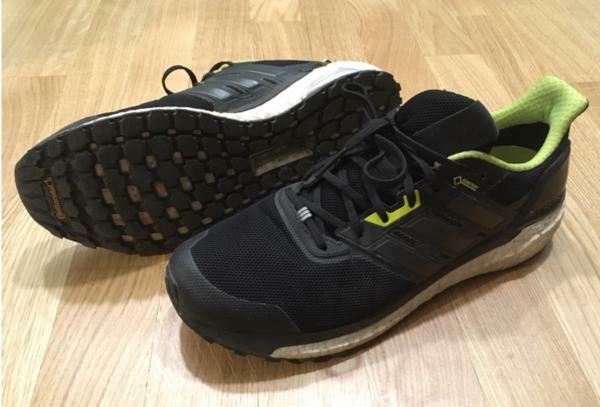 The Gore-Tex® upper of the Adidas Supernova GTX worked well when it came to attaining reliable shielding against water infiltration, most runners reported. The outsole unit’s rubber compound offered sufficient traction on both dry and slick surfaces, according to many consumers. Some testers welcomed the steady and sturdy underfoot platform, noting that it kept them sure and secure throughout their running session. The cushioning system felt suitably comfortable, based most consumers’ feedback. A few runners appreciated its sporty yet appealing look. Several consumers claimed that the façade looked awkwardly bulky. The Adidas Supernova GTX gained some adoring fans who loved its capable components and reliable performance. This neutral running shoe apparently had parts that functioned exceptionally well. Notably, the Gore-Tex® membrane and the sole unit were lauded for their usefulness in wet and slippery conditions. There were a few who didn’t like the design, but that’s an opinion that evidently didn’t detract from this running shoe’s overall efficacy. This has been my main shoe for wet or cold weather running the last two winter seasons here in Berlin, Germany. It’s got good weatherization, great traction, and is quite comfortable, but does have some glaring faults as well. The shoe looks pretty good to me, especially the black and yellow colorway. I have no qualms about wearing these around town when it’s raining out. They’re subtle and have a clean, dare I say chic look, other than the red/yellow colorway which I find pretty out there and all the other different colorways look pretty good too. Looks aside, the upper keeps water and cold out decently well. I have yet to get home with my feet feeling wet or cold in these. The upper is tolerably breathable for a waterproof upper, as one has to expect some breathability and sweat-wicking issues. The heel cup works fine, and maybe it’s because of the narrowness of the forefoot, but I haven’t experienced any slippage. These fit fairly snug and true to size. If you’re not already familiar with Adidas Boost cushioning, you must be living on a desert island. It has definitely re-defined the entire running market but recently has been losing a bit of steam. Some would say because of it’s over proliferation. Also, there have been numerous advances in the market, as all other competitors have searched for their answer to Boost. Either way, it provides excellent energy return, and this shoe is no different - it’s springy and feels lighter than you’d expect of a hefty shoe. There’s a great springiness, that is supposed to last considerably longer than competing foams; however, at 100 miles I can’t comment on the longevity just yet. The Continental rubber outsole has really good traction and seems quite durable as well. I’ve taken these out in the rain, sleet, snow, and icy conditions and the grip is one of the best I’ve tried thus far. I’ve run with these on pavement, dirt and stony terrain, and the grip is great, as well as providing a little bit of protection against rocks. No matter how I want to critique these for, they do perform their most basic function. That is to provide a dry, warm and grippy shoe in wet and cold conditions. That’s what they’re made for, and they definitely fulfill that mandate. So if you’re looking for a shoe for that specific purpose, you can count on these. While I like the looks of this shoe, and it functions reasonably well. The thing about weatherproof material is the breathability, and sometimes flexibility suffers. It’s hard to fault the shoe for issues that affect most shoes in this category. Nevertheless, the Supernova GTX performs averagely. The most egregious fault of the upper is that the ankle portion is cut low, leaving the ankle exposed. This wouldn’t be a problem on a summer shoe or a light trainer, but considering this is for wet weather, that decision really doesn’t make sense. If you run through a puddle, your ankles get wet, and it makes it easier for pebbles or dirt to get into the shoe. Why Adidas wouldn’t make a sock-like collar, as they do on the Ultra Boost All Terrain, is beyond me. Additionally, the lack of stretch in the upper makes the shoe feel on the narrow side, so I would not go for this shoe if you have wide feet or want more natural toe splay. The thinness of the waterproof laces allows them to dig into the top of the foot sometimes. This is not a full problem though, rather an occasional nuisance. At 349 grams (12.31 oz), this is not a light shoe at all. It doesn’t feel as heavy as it actually is, probably due to the energy return of the Boost, but it definitely would benefit from a significant diet. It seems that the part of the weight is from the waterproof material, as the regular Supernova, at 326 grams (about 11.5 oz. ), is quite a bit lighter but certainly on the heavier end of the spectrum. I don’t think it’s going out on a limb to say that, as serious lighter weight challengers to Boost, like Nike’s React or New Balance’s Fresh Foam, have been popping up, Adidas needs to step their game up and hopefully has some sort of Boost 2.0 in the works. The Adidas Supernova GTX has been a very solid shoe to get me through some seriously gnarly weather (slushy and icy) with dry feet. So, I definitely think they’re a solid choice, especially for long runs in those conditions, and don’t regret getting them at all. Moving forward, I probably wouldn’t purchase them again, even though they did the job fine. I want to find some waterproof shoes that are a bit lighter and breathe better. These are very sturdy and well put together. They still have quite a bit of life in them, but I will happily retire them to daily wear a bit early as they look great and are extremely comfortable to walk around in. I’d say it all comes down to what one is looking for in a shoe, depending on where you live and what kind of weather conditions and terrains you’re running. Adidas has done a solid job of making a grippy, waterproof, well-cushioned shoe that doesn’t sacrifice either looks or durability. The Adidas Supernova GTX is a neutral running shoe that’s designed for the roads. It is specially designed for running on wet and slippery surfaces. The upper unit features the Gore-Tex® membrane, which prevents water from entering the foot-chamber. A streamlined look allows it to be fashionable, as well. The midsole unit makes use of the Boost™ technology, one of the brand’s most prominent features in their stable of running shoes. It offers bouncy steps through its highly responsive nature. Because this shoe is designed for the winter season, its outsole is optimized to have the functionality and steadiness of snow tires. The Adidas Supernova GTX has a standard running shoe length. It follows the usual choices of consumers when it comes to size. The available width is D – Medium. It is only available for men. It has a semi-curved shape which mimics the natural curvature of the human foot. The outsole unit of the Adidas Supernova GTX makes use of Continental™ Rubber. This compound is mostly known for its use in car tires. Its heightened strength allows it to protect the midsole from wear and tear. It also doesn’t easily slough off. Just like the popular Adidas Ultra Boost Uncaged, the Supernova GTX uses the Stretch Web design that accommodates the natural flexibility of the wearer’s foot. Grooves and spaces all across the outer sole render the midsole more adherent to the runner’s movements. Moreover, the rubber has been configured to look like nubs that are connected by subtle webs. These protuberances help in gripping the surfaces, ensuring traction on both dry and wet ground. The primary midsole unit of the Supernova GTX is the boost™. It’s created from the amalgamation of small thermoplastic polyurethane units. Its purpose is to provide a bouncy yet steady underfoot experience. According to Adidas, it doesn’t break down quickly, as well. In the heel part is adiPRENE, which is made out of resilient ethylene vinyl acetate. It aims to provide additional cushioning, especially during the striking phase of the gait cycle. A wishbone shaped thermoplastic unit is added to the midfoot part of the platform. Named TORSION SYSTEM, it fundamentally acts as a foundation that steadies the midfoot and prevents it from collapsing during the running session. It’s also designed to encourage a more efficient transition through the gait cycle. The respoEVA is a sock liner that adds a bit more cushioning for the runner. It’s molded to take the profile of the underfoot contours, mildly supporting the arch and other spaces. The Adidas Supernova GTX has an engineered mesh upper. It’s designed to provide breathable support throughout the running session. Thin overlays are printed onto the façade of this running shoe. They reinforce and provide structure while also providing a secure coverage. Gore-Tex® is a membrane that completely staves off water infiltration. It’s also designed not to hinder the breathable nature of the upper unit. The heel collar features memory foam. It contours itself to the shape of the wearer’s lower ankles and heel, making sure to provide security and added cushioning. The FitCounter is a thin external heel counter that secures the back of the foot in place. It also prevents any accidental shoe removals from happening. A pull tab is added to the back part of the collar. It makes wearing and removing the shoe an easy task to do.